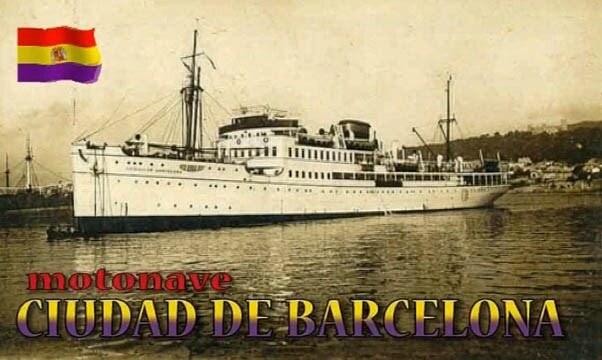 On Wednesday 30th May 2012 there will be a commemoration at Malgrat de Mar, north of Barcelona to commemorate the 75th anniversary of the sinking of the Ciudad de Barcelona. Four relatives of survivors will be attending and all are welcome. The event will start at Malgrat de Mar ajuntament at 0900 and will include a boat going out over the wreck to lay flowers and to remember the 60 or 65 Brigaders who drowned in the sinking. A bilingual round table and discussion at the Archives of Malgrat de Mar with students from the town will also take place aswell as a tour of the town by historian Sonia Garangou in the afternoon after lunch. A film presentation of the wreck as it is today and a report on the sinking made by Catalan TV3 will also be shown. If you wish to join us please contact me on pdlhistoria@gmail.com and I will send you directions from Barcelona. For relatives of survivors who read this, a beautiful booklet in Catalan and English is being produced by the Ajuntament of Malgrat de Mar in a limited edition of 150 copies. If relatives would like me to send a copy to them please contact me with the name of your relative and any memories of their experiences that you might have to add to our collection of memories and I will send you a copy. A small charge would have to be made for postage and packing, but if you could pay a mutual friend in the USA that would be very helpful (It will go towards materiel for further research in the Tamiment any case!). Please let me know well in advance so I can reserve enough copies. More information here. Of particular significance was a meeting with over 100 local students in a question and answer session with children of the survivors. I hope that their curiosity was aroused. The questions asked seemed to indicate that. Many thanks to the town archivist Josep Maria Crosas and Malgrat de Mar ajuntament for arranging a moving and emotional day for the children of survivors. A link to a video of the 75th anniversary of the sinking of the Ciudad de Barcelona last May 30th. The laying of 65 carnations whilst names were read out over the wreck was very moving. Wendy Lewis of Cor Cochion, and niece of American survivor Sydney Shostek, can be heard singing the haunting tune “Jamey Foyers”. Also, below is a link to an electronic version of the linited edition booklet in Catalan which was produced by Malgrat de Mar Ajuntament and given aeay free to commemorate the anniversary. Though it is in Catalan, hopefully readers can use Google translate to understand the text. Many thanks to Archivist Josep Maria Crosas for making this event such a success. mein Onkel, Willi Remmel, war auf der “Ciudad”. Zum Glück konnte er gerettet werden und kämpfte in den Internationalen Brigaden bis zur bitteren Niederlage. In Frankreich wurde er an die Gestapo ausgeliefert und kam in Deutschland in verschiedene Konzentrationslager. Mein Onkel ist schon vor längerer Zeit verstorben, doch wir halten sein Andenken in Ehren.